Look no further...best videographers around!! There aren’t enough stars on here for Mike and Kelsey. They came recommended to me by our Photographer (Racine Photography) and by the end of our wedding we felt like we had known them a lifetime. They were so professional and insightful that it made our entire process so easy on us. They are friendly and absolutely amazing to work with. The video they captured was stunning and solidified that hiring a videographer was the best decision we made out of the entire wedding planning process. 100 stars ⭐️!! We hired Billodeau Video Productions for our wedding and will forever be grateful! Mike & Kelsey have such amazing talent and was so easy to work with. They were very responsive with questions and organized. My husband was in tears at the wedding when Mike showed him a quick glimpse of what he just captured. Mike & Kelsey have such a creative talent, they even brought us downtown to film (3 minute drive). Those shots are my favorite from the whole wedding, I would’ve never thought of leaving the venue. We recommend using Mike and Kelsey, you will not be disappointed & you’ll have amazing memories that were captured on your most special day! Mike and Kelsey were amazing to work with! Open communication from the start and they DELIVERED! During my wedding they managed to be everywhere at the time time never seen. They guided us and captured everything from shoes to I do’s! You can tell how passionate they are by their work. I am able to relive my wedding day because of them. Forever grateful! When planning my wedding over 2 years ago, one piece of advice that now seems like the most important was “get a videographer. Your night will go by so fast and you’ll wish you had a video to get all those things you missed”. My husband and I chose Billodeau video productions as a referral from our photographer and they most certainly did not disappoint. Right from the beginning Mike and Kelsey were extremely professional but still made it feel like we had known them for years. They helped us secure all the little details and any last minute questions I had Kelsey got back to me almost immediately. They teamed up with my photographer to make all shots possible and not delay us from getting back to our guests. I would recommend Billodeau video productions over and over again. Thank you Mike and Kelsey for helping us capture the best day of our lives! Hiring Mike & Kelsey as our videographers for our special day was the BEST decision my husband and I could have ever made (besides for getting married, of course!) They are truly the dream team - Mike and Kelsey are clearly passionate about their couples which translates beautifully to their work. They are beyond talented, beyond responsive to requests, and really overall fun and kind people to work with. It might seem intimidating to have people record you all day, but they really make you feel comfortable and hype you up! We couldn't be more happy of our finished product and we can't wait to show our children one day! Seriously the best investment someone could ever make. Thank you, Kelsey & Mike!!!! Thank you so much Abbey! We absolutely loved being able to tell your story. You and Adam have such beautiful chemistry and it is so clear that you two are perfect for each other! We wish you a lifetime of happiness and congratulate you on becoming Mr. and Mrs. Fay! Cheers! Mike and Kelsey are the dream team. I don't even know where to begin. Mike and Kelsey were incredible to work with and captured our day seamlessly. I could watch our video over and over a million times and never be bored. It puts me right back in that dress, on that day, surrounded by everyone we love. I can feel the emotions that I had that day when watching the video, absolutely amazing. To me, it was an investment in memories that we will be able to forever show our children, grandchildren, etc. To have two people that are so truly passionate about their job makes the entire process flawless and stress free. I will recommend Billodeau Video Productions to everyone I know! Choosing to go with Billodeau Video Productions was one of the best decisions we made throughout the planning process. They were AMAZING to work with. They were courteous, professional and fun every step of the way. When we watched our wedding videos (in between crying) we couldn't believe how much they had captured without really making us aware of them at all! Throughout the day, they blended in and those who did speak to them were telling me how awesome they both were. The videos were stunning and made us both feel like movie stars. I'm picky when it comes to all things and I'm telling ya, you can't find better videographers for the price (and maybe just in general). Hire them. You will not regret it. My husband and I would definitely recommend Billodeau Video Productions! Mike and Kelsey were amazing to work with. They're so talented and their passion and energy they put into their work is infectious. 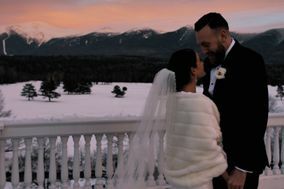 We received our highlight video quickly after our wedding, and the moments they were able to capture and edit together quickly exceeded our expectations and we watched it at least a dozen times while we were on our honeymoon. Matt and I made the very last minute decision to hire Billodeau Video for our wedding this spring and honestly it was the best decision we made. From the moment they stepped into our hotel rooms they had a relaxing confidence and led us to take some really great shots. People told us that we wouldn’t want a videographer at our wedding because they would be just one more vendor in our way grabbing our attention. Those people couldn’t have been more wrong! At the ceremony they captured the best moment of our lives and I didn’t even notice them. At the reception they focused on all the details that as a groom you don’t see in the moment. They caught the tears of joy and the epic dance moves as the night progressed, all so seemlessly. We highly recommended Billodeau Video to everyone. From start to finish they were phenomenal to work with. We have watched our highlight video hundreds of times and it’s the perfect thing to show off your big day. We want to say thank you for being such a special part of our day! I cannot say enough good things about Billodeau Video. Mike and Kelsey were so flexible, professional, and fun to work with from the very beginning. My husband and I have loved reliving our wedding day over and over through their amazing work. I can’t recommend them enough. My husband and I cannot say enough about Mike and Kelsey. They were wonderful to work with, very professional and creative. We received our highlight video as well as our full length video and couldn't be happier. You can tell that they both are very passionate about their work. I will continue to recommend Billodeau Video Productions to all future couples! Loved working with Mike and Kelsey. They made the process incredibly easy for us and were very quick to respond to any questions we had. The final video we got of our ceremony was exactly what were were looking for and are so happy we decided to capture it with them. Mike and Kelsey were amazing to work with! They are both so talented and you can tell they love what they do. They got our highlight video to us in just three days! It was the most amazing surprise to be able to watch that while on our honeymoon, it brought us to tears. I’ve watched the highlights so many times and I honestly love it more each time. We haven’t received the full length video yet (we just got married on 9/2) but I know it’s going to be amazing and I cannot wait to see it and be able to relive our special day. We were originally on the fence about having a videographer but now I cannot imagine not having one! My husband and I highly recommend Billodeau Video Productions and we cannot thank you both enough for all you did for us! Mike and Kelsey are absolutely incredible. My husband and I feel like this was the best spent money. We LOVED working with them. They are so lovely, talented, and accommodating. We certainly felt like it would somehow be awkward knowing we were being filmed, but at no point in time did it ever feel that way. They totally blended in with everything that was going on around them. They are so quick to respond and address any concerns you may have. They value your vision and have amazing suggestions. They provided such a high quality forever keepsake. Not to mention it was such a joy to have them at our wedding. Our wedding video brings such life to our special day. We highly recommend them. They are the best! Mike and Kelsey were absolutely amazing at our weddin! My mom hired them as a surprise for us and we are so glad she did. The highlight video was ready for us shortly after the wedding, and it was absolutely perfect! We also got the full length video which came out amazing! We weren’t sure what songs to pick for the videos, but Mike provided several great suggestions. We are so happy that we have these videos of our wedding. I highly recommend Mike and Kelsey for your videographer! I talked to multiple people throughout the wedding process that said they budgeted for the videographer last, if I have one recommendation do it first and hire Mike and Kelsey!!! They are truly amazing! I have so many wonderful things to say I can't list them all, they are kind, dedicated, and passionate! I have already watched the clip they sent us at least 20 times and I am in awe each and every time! They capture every single special moment that you may miss or want to see again. I could go on and on, but all you have to do is talk to them once and you will know exactly why we loved them so much! Mike and Kelsey are an amazing team with such a talented eye and passion for what they do! They captured our day so perfectly with moments I would have never seen without our video. They captured every moment while making it seem as though they weren't even there. They gave great suggestions to our photographer to get some really pretty water reflection photos and were great about communicating with the other key people organizing our wedding. The DVD's we received were in cases with pictures of our day on it and captioned like a real movie. I am so impressed with how our movie came out. It went way beyond my expectations! Videography on your big day is a must! Everything seems like a blur after all is said and done and this will allow you to relive it like it was yesterday! We highly highly recommend Billodeau Video Productions!!! Mike and Kelsey were very professional and a joy to work with. Overall, we had a great experience working with them as they both were very responsive and communicative to ensure all our questions were answered and details sorted before the big day. The day of they both were very wonderful and professional checking in to make sure we didn’t need anything before everything started. They captured all of the special moments of the day - yet we barely noticed they were there! While on our honeymoon they sent us a one-minute preview video that immediately brought us to tears and continued to keep us apprised of when the video would be ready and what songs we wanted to use for it. We received the video very quickly after and they managed to capture moments that we missed or had forgotten in the blur of the day! We have watched it multiple times in the week that we have received it and will continue to watch it for many years to come! I will recommend Mike and Kelsey to all of our friends and family who will be getting married in the years to come! WOW is all we can say. We were not originally planning on a videographer but Mike and Kelsey were recommended to us by a friend. Now I can't imagine NOT having this video. Mike and Kelsey are extremely talented and their passion is shown through the tremendous product that we received. They were able to capture the big moments throughout the day and the little details that you overlook because the day just goes by way too fast! We also had them pick out our music for the videos because they have excellent taste. If you think you can not afford a videographer then something else needs to go! You will never regret having a video of one of the most important days of your life! Billodeau Video Productions is the best of the best! We actually didn't consider a videographer until about two months before the wedding. Mike and Kelsey were referred to us by our photographer who met them working another wedding and was totally impressed. She was 100% accurate. Their communication is quick, friendly and professional. They are so easy to work with and the day of the wedding, Kelsey hung out with the girls and Mike hung out with the guys. They were both very friendly and we hardly knew we they were there most of the time. A few days after the wedding, they did a preview on YouTube for us. I watched it about 10 times and cried every time. It was such an awesome sneak preview to the video. The video itself was perfect. We had a great time watching it and they did such a great job editing it and putting it together with the music we picked. However, the best part of the whole video... the credits. They knew that my husband and I loved DeadPool and if you have ever seen the movie, you know that the credit roll to Careless Whisper in a comic format. Our wedding credits were done in the same way to careless Whisper. For non Dead Pool fans, this might not seem huge, but my husband jumped off the couch and immediately texted Mike to say thank you. We didn't ask for this but with all of our communication, the meeting, spending time with us- they knew this would be a totally awesome and make our day. This is what sets them apart from everyone else. They personalized the credits to us. They are so creative and talented and I can't recommend them enough to anyone looking to video their event. Mike and Kelsey are did such a great job with our wedding video and highlight video. They were so easy to work with, communication was great and the final product was amazing. Our video was tailored to us and our personality. This was no cookie cutter video. We couldn't be happier with our videos. They really have a passion for their craft and it shows. We just got married on the 8th of October and used Billodeau Video Productions to film our special day! We decided we wanted a videographer so last minute I was afraid we wouldn't be able to find one! I saw their Facebook page and their highlight videos of the weddings they have done and knew I wanted to use them! They even worked their schedule around our wedding day so they could film it! We already have our full length DVDs edited and beautifully packaged, they got it to us so quickly! The video was Fantastic! There were so many parts we had forgotten about because it all goes by like a blur! It was so great to re-live the best day of our lives and they captured it perfectly! They do such great work and they're great people. You can tell how truly passionate they are about capturing weddings and it shines through in their work! I HIGHLY recommend Billodeau Video Productions! Thank you SO very much!! Most people don't think to have a videographer at their weddings. People always just think about photographers. But wouldn't you like to see all the moments the photographer didn't catch? Or the in the moment facial expressions? Brian and I having Mike and Kelsey videograph our wedding was one of the best decisions we made. They put so much thought and effort into making sure your video is exactly what you are looking for. It's amazing to see moments happening that you would have never known about like, when the groom is getting ready. The bride always wonders what he's really doing lol. They take your ideas, their professionalism, and all of your amazing memories and come out with an a gorgeous video for you to remember your day forever. They produce a video that you sit and watch over and over and it will never get old. You'll go from laughing to crying, but always filled with happiness. If you're looking for a videographer these two are the best out there!